Artist renditions of the proposed Portsmouth skateboard park. “It helps in the rebranding of our city,” said First Ward Portsmouth City Councilman Sean Dunne. Dunne was referring to two projects he has been closely involved with: renovating and opening McKinley Pool and bringing a skateboard park to life in what is currently Weghorst Park near Fourth Street and Madison. While Dunne didn’t say so, from his comments, it seems as if the pool project is by far the most likely to get off the ground first. Dunne wants to finish about $9,500 in renovations to the pool and have it open to the public by Memorial Day. As some may remember, there were problems with getting the pool open last summer. Dunne said most of those issues related to the water problems the city was having at the time. Most of the planned renovations center on the pool’s restrooms. Dunne said in some cases, restroom stalls even lack doors. Among the improvements planned for both male and female restrooms are new doors and partitions, new hand dryers, two baby changing stations (Dunne says there are none presently) and new mirrors. Near the restrooms, new water fountains will be installed, fountains Dunne said will be a major improvement. Elsewhere, McKinley Pool will receive new aluminum ladders. Dunne also is one of those behind the push to have McKinley designated on the National Register of Historic Places. If you know Portsmouth’s history, you may know the pool played some part in the American Civil Rights Movement. Once upon a time, Portsmouth’s famous Dreamland pool was segregated. African-Americans simply were not allowed to swim there but sometimes sought water recreation elsewhere. One of those alternative locations was the Scioto River in which 14-year-old Eugene McKinley drowned. The pool was named in his honor. Dunne wanted to make clear the push to renew McKinley Pool was not a solo effort. He specifically recognized community member Elsie Shabazz as decidedly deserving of some credit. Regarding the skate park, Dunne said the effort launched in 2014 but then kind of lost steam for a while. More recently, backers have applied for a couple of grants to help build the park, most specifically from the Ohio Department of Natural Resources and the Tony Hawk Foundation, named for the famous professional skateboarder. ODNR will not make a decision on their roughly $150,000 grant possibly until spring. 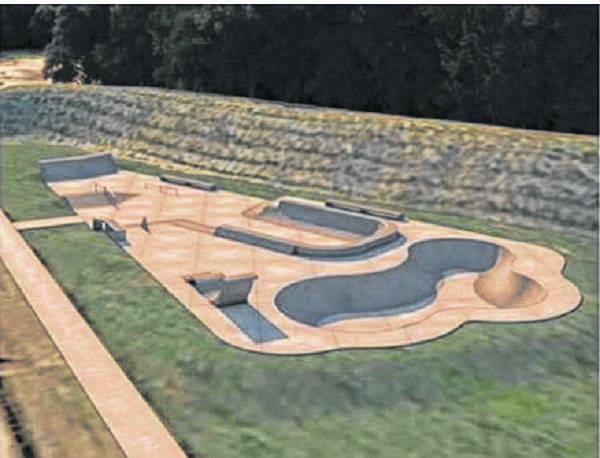 Dunne said the Portsmouth skateboard park committee submitted the Hawk grant only in the last week or so but added some decision may arrive in the next six to eight weeks. The skate park project only fairly recently received a just over $1,000 donation from the Shawnee State University Development Foundation. According to a skate park Facebook page, the project also earned a $10,000 grant late last year from the Southern Ohio Medical Center. Of the two grants in the works, the ODNR grant is undoubtedly more monetarily significant. The Hawk grant only would supply about $25,000 towards the roughly $300,000 needed to build the park. Dunne made a point of saying he does not want to build just any skate park, but one which would compare with parks in much larger cities such as say Huntington, which Dunne said has a very well thought of skate park. Supporters received a lot of help with the design from Spohn Ranch, a skate park design firm in California. “We very purposely punched above our weight class,” Dunne said. According to Dunne, the rest of city council already has approved the design for the park. With all that in mind, Dunne said skate park supporters are nowhere near finished hunting grant money and seeking public funding. They also have and will continue to plan fundraisers, such as one held at a local tavern last month. Dunne again wanted to make clear the skate park effort was not a solo effort. He went out of his way to thank local businessman and entrepreneur Tim Wolfe for a letter he provided to the Hawk Foundation supporting the project. He said the letter showed the park has the support of the community in general as well as the local business community, of which Wolfe is undoubtedly one of the young leaders. Wolfe also happens to own property near the proposed location of the skate park, another factor Dunne believes will be a plus in the eyes of the Hawk Foundation. Dunne believes efforts at McKinley Pool as well as the coming of the skate park fit in well with the efforts of groups such as the Friends of Portsmouth, who were responsible for the just completed Winterfest. “There is certainly some movement at improving the city,” Dunne said. He talked a bit about moving Portsmouth away from its industrial past – not a past it’s likely to regain, in his opinion – as well as the area’s sad reputation as ground zero for the well-publicized opioid epidemic.